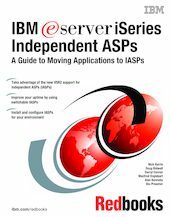 This IBM® IBM Redbooks publication explains how to install and configure the new independent auxiliary storage pool (IASP) functionality of OS/400® V5R2. It is designed to help IBM technical professionals, Business Partners, and Customers understand and implement IASP in the IBM eServer iSeries server and under OS/400 V5R2. In addition, this book provides the background information that is necessary to plan, implement, and customize this functionality to your particular environment. It provides advice on running native OS/400 applications with either application data or most application objects residing in an IASP. Considering you can also use IASPs in a cluster environment, this book shows you the basic steps to make your IASP switchable between two iSeries servers in a high-speed link (HSL) loop.